Farrar, Straus and Giroux (BYR), 9780374303037, 208pp. Claire and Abi have always loved their summers at the lake house, but this year, everything's different. Dad and Pam, their stepmom, are expecting a new baby, and they've cleared out all of Mom's belongings to make room. And last summer, Abi was looking at boys, but this summer, boys are looking back at her. While Abi sneaks around, Claire is left behind to make excuses and cover up for her. Claire doesn't want her family to change, but there doesn't seem to be a way of stopping it. By the end of their time at the house, the two sisters have learned that growing up doesn't have to mean their family growing apart. 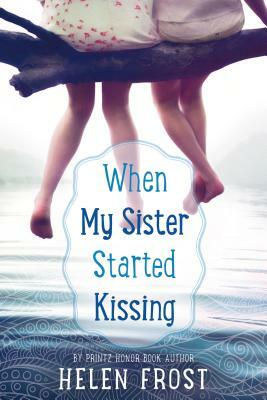 WHEN MY SISTER STARTED KISSING is Helen Frost's beautiful novel-in-verse about summertime and coming of age. Helen Frost is the author of several books for young people, including Hidden, Diamond Willow, Crossing Stones, The Braid, and Keesha’s House, selected an Honor Book for the Michael L. Printz Award. Helen Frost was born in 1949 in South Dakota, the fifth of ten children. She recalls the summer her family moved from South Dakota to Oregon, traveling in a big trailer and camping in places like the Badlands and Yellowstone. Her father told the family stories before they went to sleep, and Helen would dream about their travels, her family, and their old house. “That’s how I became a writer,” she says. “I didn’t know it at the time, but all those things were accumulating somewhere inside me.” As a child, she loved to travel, think, swim, sing, learn, canoe, write, argue, sew, play the piano, play softball, play with dolls, daydream, read, go fishing, and climb trees. Now, when she sits down to write, her own experiences become the details of her stories. Helen has lived in South Dakota, Oregon, Massachusetts, New York, Vermont, Scotland, Colorado, Alaska, California, and Indiana. She currently lives in Fort Wayne, Indiana, with her family.